The Peoples Democratic Party (PDP) has asked President Buhari to stop gloating and showboating on Nigerians with what they described as "the stolen 2019 Presidential mandate". The party further describes President Buhari’s renewed attack and blame game on PDP administrations as a lame attempt to divert public attention from the overwhelming evidence that he rigged the elections, as well as from the plots by his Presidency to obstruct the clear winner, Atiku Abubakar, from going to the tribunal to reclaim the mandate freely given to him by Nigerians. President Buhari and his All Progressives Congress (APC) should know that the PDP and Nigerians are focused and will not be distracted by any sort of blackmail in the pursuit of the mandate and we are confident that our justices will never allow an illegitimate government to sit over the affairs of our dear nation. We ask; was it the PDP that siphoned over N9 trillion, through underhand contracts, as detailed in the leaked NNPC memo, in the same sector President Buhari directly supervises as Minister of Petroleum Resources? Was it the PDP that stole the over N1.1 trillion worth of crude illegally lifted and diverted with 18 unregistered companies in 2017; the over N1.4 trillion in fraudulent oil subsidy regime and many more scams, including funds meant for the welfare of victims of insurgency in the North East under the Buhari administration? Whereas the PDP administrations created wealth and applied our national resources on massive infrastructural development in all critical sectors; paid off our huge foreign and domestic debts and grew our economy to be one of fastest growing in the world, President Buhari, within a space of three years ran our economy into recession and cannot point to any development project his administration initiated and completed despite the huge opportunities at his disposal. President Buhari must note that Nigerians are no longer interested in his incompetence and blame game and this is the very reason they voted massively against him on February 23. 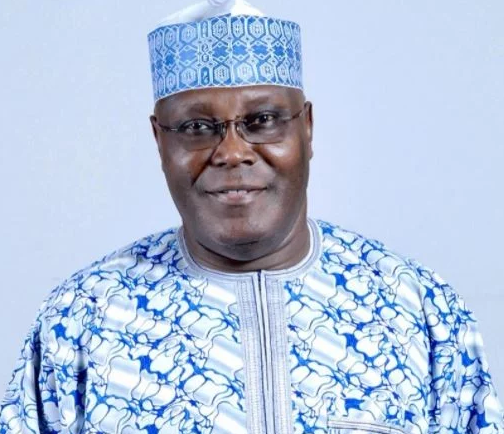 He should therefore end his diversionary tactics and get ready to meet the people’s candidate, Atiku Abubakar, in court. President Buhari has said that the legal challenge against his re-election is not surprising. The President made the statement while addressing newsmen shortly after he and his wife cast their vote in Daura, Katsina state, earlier today. INEC had on Wednesday, February 27 declared Buhari winner of the 2019 presidential election. Buhari won the elections in 19 states, polling a total of 15,191,847 votes, he defeated 72 other candidates including his closest opponent, Atiku Abubakar, who polled a total of 11, 255,978 votes and won in 17 states and the FCT. However, President Buhari in his reaction to Atiku and the PDP’s move told newsmen on Saturday that he expected the challenge beforehand. Regarding fears of a possible eruption of violence during the governorship elections, President Buhari said he is leaving the situation to the law enforcement agencies. He said the police have identified all flashpoints and have made arrangements to counter them. Senator Shehu Sani, says he supports President Buhari's decision to question members of the main opposition party PDP, over the $592 billion expended on projects when the party was in power for 16 years. Recall that President Buhari, yesterday March 7th, said Nigerians need an eplanation from the opposition party on how it expended such amount of money. Writing via his Twitter handle, Sani said everyone that was once in the PDP should go and prepare for a presentation before President Buhari on how they expended the $592 billion. President Buhari arrived his home town of Daura on Thursday ahead of the Governorship and State Assembly elections scheduled for Saturday. He landed at the Daura Helipad in a Presidential Chopper marked NAF-541 at 6:50 p.m. in company with his aides and close family members. The president was received by the Emir of Daura, Farouk Umar, his kinsmen, and hundreds of well-wishers. The president’s wife, Aisha Buhari, will also host a thanksgiving dinner for women and youth organisations in Daura. The Alake and Paramount Ruler of Egbaland, Oba Aremu Gbadebo, on Tuesday, advised former President Olusegun Obasanjo to desist from his ceaseless attacks on President Muhammadu Buhari. Gbadebo, who noted that Obasanjo had been ‘‘a warrior’’ all his life, urged him to rest, fight less and rather take a position of a consultant at his new age. ‘‘At 82 years, I think you should keep your sword more rather than use it always,’’ he said. Obasanjo, who responded to goodwill messages from friends, family members and well-wishers at the programme, responded by saying that the issues between him and Buhari were not personal. If it is my brother that is occupying the leadership role and he is not doing what I believe he should do, he must be criticised and that is what democracy is all about. I have been in that position longer than any Nigerian will ever be there. Kim Kardashian left nothing to the imagination as she dressed in a risqué sheer unitard for an evening stroll in Paris on Wednesday. The 38-year-old reality star went braless beneath the racy outfit which exposed her scanty underwear.